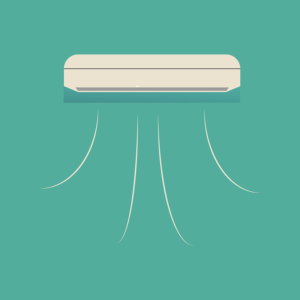 Why is There Moisture in the Air Conditioner? This question is a very common question in the Dallas Air Conditioning business. The term air conditioning is used instead of the term air cooling because the air conditioning system does two things: first, it cools the air and then second, removes the moisture from the air. Have you ever experienced a warm, muggy, sticky day in Dallas? It can be miserable because the air is holding a lot of water or moisture. This condition is called humidity. Early cooling systems did not account for the moisture in the air and thus did not do as good a job as for today’s air conditioners. In Texas today, the modern air conditioner has an evaporator coil inside your house that blows air over the ice cold coils and cools your air. When the air hits the ice cold coils, any moisture in the air attaches to the condensate coils and then runs down the surface to a collector pan. The pan has a PVC pipe connected to it and runs the water outside or into your sewer system. If you have ever had an ice cold drink served to you outside on a humid day you know what I am talking about. You see, the moisture quickly forms on the outside of the glass and runs down to the napkin. You can substitute the coil for your glass and the pan for your napkin and you have the exact same thing. Without removing the water from the air inside your home, mold can grow, wallpaper can peel and you will sweat a lot more. That’s a big bummer! Units manufactured by Trane, Ruud, Lennox, Bryant, Carrier or Rheem all operate on the same principle. Our trained technicians at Dallas Heating and Air Conditioning know how to handle problems with leaking or dripping air conditioning units in all Dallas area.